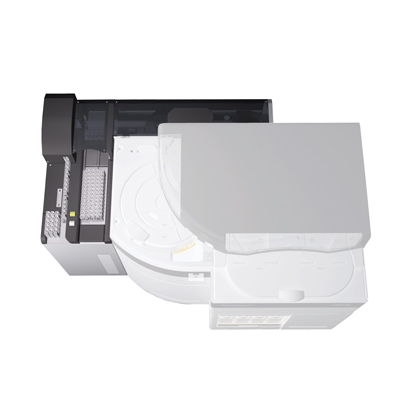 Soft X-ray Emission Spectrometer(SXES) | Products | JEOL Ltd. 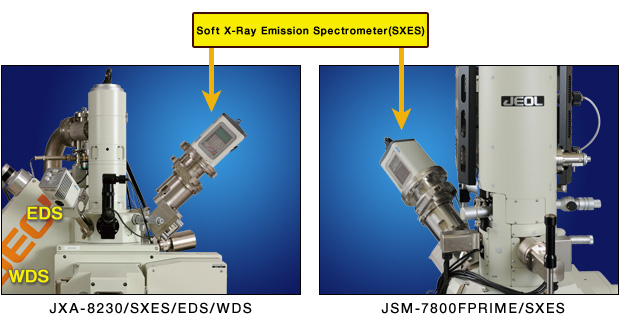 The Soft X-Ray Emission Spectrometer (SXES) is an ultra-high resolution spectrometer consisting of a newly-developed diffraction grating and a high-sensitivity X-ray CCD camera. 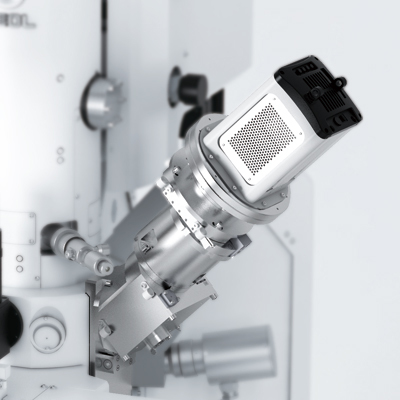 In the same way as EDS, parallel detection is possible, and 0.3 eV (Fermi-edge, Al-L standard) ultra-high energy resolution analysis can be performed, surpassing the energy resolution of WDS. 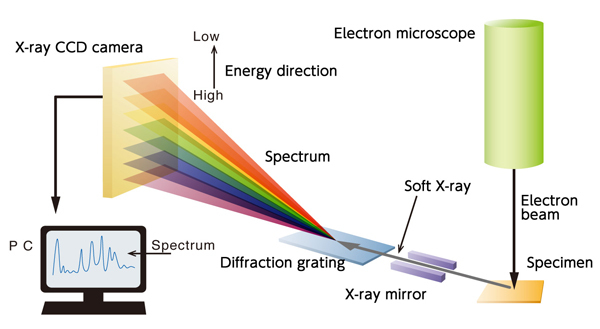 The newly-developed spectrometer optical system design enables simultaneous measurement of spectra with different energies, without moving the diffraction grating or detector (CCD). 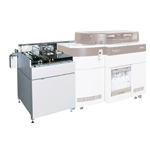 With the high energy resolution, chemical state analysis mapping can be performed. 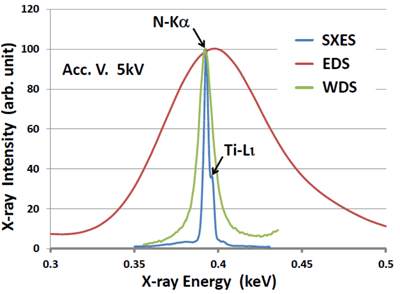 For titanium nitride, the peaks of N-Kα and Ti-Ll are overlapped. Even with WDS, and waveform deconvolution using a mathematical method is required. As illustrated in the figure below, there is a high energy resolution with SXES, allowing for TiLl to be observed. The example below shows large area maps of LIB samples with different charge states. 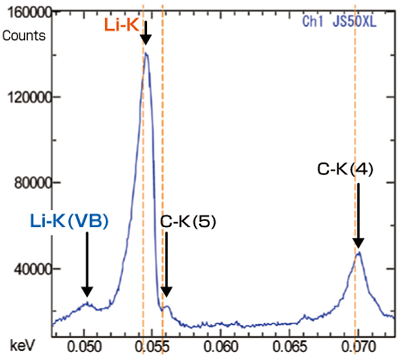 SXES can map the Li-K peak at both the valence band state (left) and the ground state (middle). A carbon distribution map (right) can also see the function on the LIB that is fully discharged. 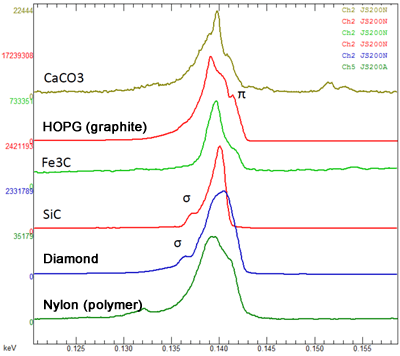 It is possible to measure the differences between diamond, graphite and polymers. The differences can be observed with the additional peaks from π and σ bonding. As mapping takes a spectra from each pixel, additional maps can be generated for peak shifts of 1 eV and shoulder peaks. For nitrogen as well, the chemical bonding state can be analyzed from the spectrum peak shape. 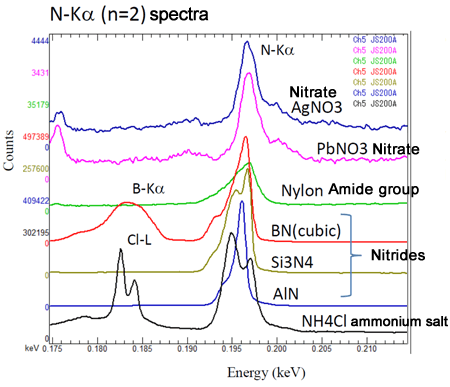 The peak shapes for nitrates and nitride are completely different, and it is even possible to observe the unique peak shape for ammonium salt, which is very beam sensitive.